As I wrote this, I was finishing up work for the day to head home to get ready to celebrate my 5th wedding anniversary with a quiet dinner at one of our favourite fancy restaurants. Though my husband is not pagan, we did a handfasting with cords of orange, brown, green, and silver in a beautiful loft space gallery that used to be a piano factory. It was an overcast day that rained on and off, and we didn’t care, as long as we had each other and were surrounded by our friends and family. We bound ourselves to one another, and by the grace of the Gods, the rain paused just after our ceremony so that we could run outside to get some outdoor photos amongst the glorious fall colours of late October. I didn’t have my parents there to celebrate with me. They both passed away years before, and never even met my husband. It breaks my heart every time I think about how much my husband and my dad would have gotten along, or how easily my mum would have welcomed him into the family. I never dreamed of how my wedding would be, and was not that little girl who walked around in my mother’s shoes and a veil on my head and “played wedding” as easily as “playing doctor” or “playing school” or “playing tea time”. In fact, though I wholeheartedly believe in love and wasn’t opposed to marriage, enough time had passed by that I guess I thought it just wasn’t for me. So I never had those dreams of my dad walking me down the aisle, or getting ready in the morning with my mum. However, when the time came, their absence was sorely missed. My parents were still married for 46 years when my father died, and were not at our wedding in person to witness their youngest getting married. But I know they were there in spirit, as were my ancestors before them, and I know they come forth when the veil between the spiritual plane and the living is most porous or at its thinnest. Each year, our anniversary has felt like the start of that thinning, the overlap between summer and fall, or Mabon and Samhain and forward to Yule. And as I think on my ancestors and my immediate family that have passed on, I don’t think of them as lost. I think of them as pillars of love and endurance. They have faced so much in their lives, living through wars and social progress and political strife and so much more than what I have experienced, and if I can get a glimpse of them through the veil at this time of year, or gain a portion of their wisdom or obtain a sliver of their bravery, perhaps I would have even more inspiration to keep my heart strong for my marriage. We mark and celebrate our anniversary as a reminder of how we fell in love, to look back fondly on the day we were married and celebrated our commitment to one another in front of our family and friends, and to take stock of our relationship. I also take the time to evaluate how my spirituality plays into the marriage, and how I can improve myself for myself mentally, physically, and spiritually. If we think of the wheel of the year as a ship’s wheel, we see the evenly spaced spindles that indicate each season and sabbat. It’s important to can add to our own wheels with anniversaries and special occasions so that they are actually that – special occasions. They are things that we celebrate specifically for us, separate from what others are marking, so that we can spend energy on why that day is important to us. This time of year has a lot going on for me. I honour my ancestors, I miss my parents, I celebrate my wedding anniversary, and I acknowledge the turning of the wheel as the year progresses, as sure as my heart beats. As I close my eyes and breathe in the rich scent of Autumn, my mind turns to those I have loved and lost. Those who have traveled on to the Shadow-Lands. 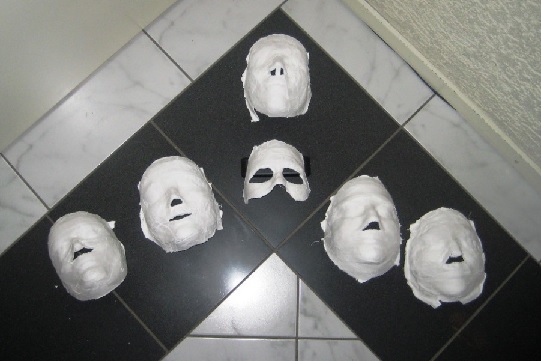 Shadowfest, or more commonly known as All Hallows Eve and Samhain, is fast approaching. This is the Season of the Witch, but most importantly, the Season of Spirits. The veil between this world and the Un-Seen (Other-World, Shadow-Lands, Elphame, Summer-Lands, Avalon, Annwn, Elysium Fields, etc.) is thinnest at this time of year. Spirits, human and non-human alike, roam the Earth reaching out to those who are willing and able to acknowledge their existence. One of the most prominent aspects of Cottage Witchery is the veneration of ones Ancestors and working with Household and Land Spirits (Brownies, Lares, Land Wights etc.). Shrines are lovingly set, offerings of food and drink are given, and interaction between the living and the dead on a daily basis happen within our walls. I speak every day to my now deceased brother. Fiercely protective and loving while alive, I find him equally so in death. 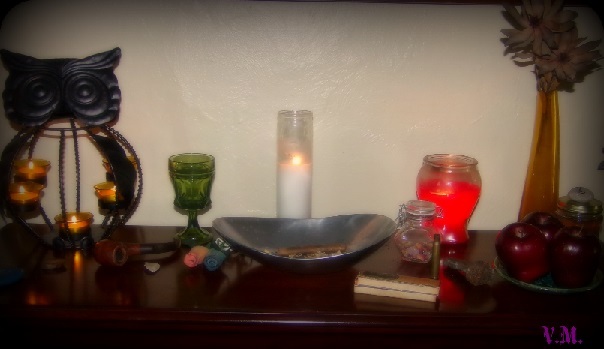 I have personal items of my brother, grandparents, both of my dads, and trinkets that represent the Ancestors and Spirits that I did not know in the living realm displayed on my shrine. It is here that I petition the Spirits for aid in magical, healing, and mundane needs. I find that my Ancestors and Household Spirits enjoy the love and devotion I bestow upon them. The more I interact, the more helpful and present they are. As Samhain approaches, veneration of the Dead among Witches and Pagans is more predominant than at any other time of the year. With the falling of the leaves and the decaying of the Earth, death can be felt more effortlessly. While this is true, the Dead and Spirits can be reached at any time. They are just a prayer away and are very keen to aid those of us in the Realm of the Living. We just have to be willing to open ourselves up to their presence and love. Creating a space for our Ancestors and the Kindly Spirits of the Shadow-Lands is the perfect way to start. Set in the North (Land of Bone and Stone) or the West (The Blessed Isles), the Ancestor Shrine can be one of the main focal points of the Witches home. It is often laid atop the fireplace or hearth but can just as easily be held within a book case or on a small table. Pictures and baubles held dear by our loved ones are lovingly placed on the Shrine. A fresh glass of water is given every morning to “feed” the Spirits and food offerings are given once a week, or on Holy Days and Birthdays. Candles are lit as a daily offering to the Ancestors and Spirits. Charms and Enchanted Waters can be left on the Shrine for our Kindly Spirits to Bless. The Spirit/Shadow Stone is an enchanted stone that I use to reach the Shadow-Lands. 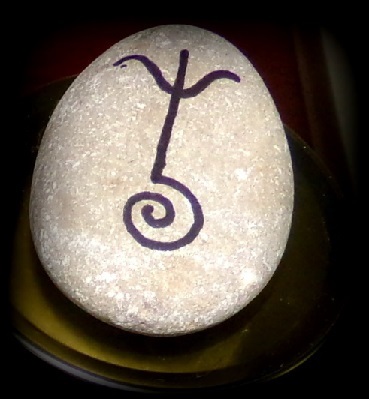 On it I paint or draw a special glyph/sigil that I created for Spirit work. Any symbol can be used as long as it connects your mind to the Spirit Realm. It is in the Shadow-Lands where I visit my Ancestors and Household Spirits. By holding the Stone within my hands it keeps me connected to both the Realm of the Living and the Realm of the Dead. I also use the Shadow Stone to aid me in any magical working that I wish the Spirits to Bless. By placing the Stone over a charm or within a mojo bag will add power to your spells. 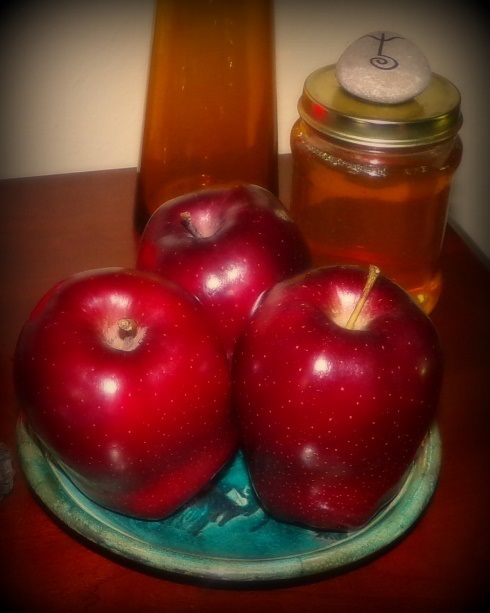 I give weekly offerings of apples and honey to my Beloved Dead. Both are appropriate foods for the dead as are pomegranates and many other foods. On Holy Days and Birthdays I offer more elaborate meals. Food that your loved ones enjoyed while living are the best to serve. The food offerings are left for a full night and are to be disposed of the next morning. There are varying ways of disposal and depending on where one lives some are more appropriate. It is up to you what feels best to do. You may throw it away, bury it, or leave the offering in the wild far from your home. I personally throw it away. I do not want to inadvertently poison or sicken wildlife. Some will disagree with this approach. Again, do what feels right to you. It is not disrespectful to throw the offering away, the Spirits and Ancestors have already absorbed the energy from the offering and have no use for it after that. The writing down of a petition or prayerful need is something that can be done with Ancestor work. 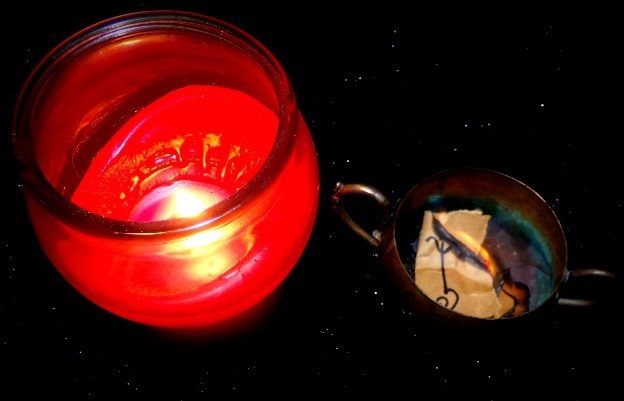 After putting my words to paper and marking it with the Spirit/Shadow Sigil, I burn the petition, placing the ashes within a special vessel. Before petitioning the Spirits for help I “warm” the Shrine by lighting many candles and waiting for at least a half hour. This “warming” of the Shrine aids the Spirits and Ancestors in feeding them the energy they need to answer your prayers. For more information on what Orion Foxwood calls an ash pot and ways to honor your ancestors please read his books The Faery Teachings, The Tree of Enchantment, and The Candle and the Crossroads. I highly recommend all three. As Shadowfest draws near, and we gather with our loved ones to celebrate, we know that our Dearly Departed are with us as well. Through loving devotion we remember all that they did for us while alive and thank them for what they continue to do for us in the Shadow Realms. Ancestor worship is important. Without our forebears, we wouldn’t be here. We wouldn’t exist. Think of all the living and dying that had to go on, just so you could have that Friday evening ice cream! It’s only fitting that ancestor rites should play an important role in our Pagan ceremonies. I guess I’m just forever the contrarian. Lately I’ve been wondering why I revere my ancestors. Take my great-grandmother’s grandfather, for instance. He ran an iron forge in Western Maryland that used slave labor and was notorious for its inhumanity to its workers. I have a baby daddy great-great grandfather and a baby daddy grandfather. One hit the road when he heard he was going to be a father. The other one bragged about his prowess, all over my small Appalachian home town. My husband recently did his genealogy and found three generations of alcoholic, gambling, unfaithful men. Who am I pouring libations for? Sometimes I take the position that the ancestors I’m praying to are better ones, farther back on the timeline, who lived exemplary lives and looked out for their progeny. Oh, for the love of fruit flies, who am I kidding? They were human! Some good, some bad, some indifferent. Some all of the above. This nagging question occurred to me when I found myself venerating certain good ancestors while ignoring the bad ones. We all have saints in our family trees, but my sense of democracy won’t let me apply the gloss. Here is my solution to this conundrum. Instead of praying to my ancestors, I pray for them. Sorry, so sorry for the slavery. Sorry for the infidelity. Sorry for the drinking, the running away from responsibility, the human nature that you, my ancestors, showed. And, sorry to say, I am no prize either. I’m a chip off the old block, a conglomeration of the goodness and the badness that made all of my forebears human. Perhaps veneration of ancestors should begin with forgiveness: to them, to ourselves, to the vicissitudes of history, climate, biology, and economics. Perhaps this veneration should include a humble understanding of the foibles of human nature. Pretending our ancestors were holy and god-like may elevate our self-esteem, but it’s dishonest. They were just people. Anxious, conflicted, complicated people: just like you and me. My ancestor practice includes this forgiveness (and extends it to the people who my ancestors did wrong). It also includes the intention to do better. I don’t want to set myself up as a paragon of virtue, but I do want to learn from, and prevent, the mistakes of the past. The more I learn about the people who went into making me alive, the more I know where I’m likely to err. This is a holy thing. This is what those complicated human beings can do for me. Anne Johnson is a public school teacher and the author of the humor blog The Gods Are Bored.